The city of Waveland finalized its redistricting plans last week, paving the way for the plan to be sent to the U.S. Justice Department for final approval. This Tuesday, the board of aldermen will hold a public hearing on the plan and then send it off for final approval. The city will keep its current four-ward system, but there are several changes in the boundaries and sizes of the wards. A major change will be in the middle-town area currently in Ward Three. The area houses the vast majority of the city’s minority population, however, the current ward boundaries split Herlihy Street in half. The new plan will place nearly all of Herlihy Street and most of the middle-town community in Ward Two. Waveland does not have a predominantly minority ward because there is only an estimated 10 percent minority population in the city. By changing the boundary lines, most of the minority residents will now be voting in Ward Two. Amar Street resident Clarence Harris–who also serves on the city’s planning and zoning commission–said Tuesday he believes the majority of the middle-town residents support the change. Ward Three will lose some of those voters, but pick up others such as the residents of apartment complexes on Waveland Avenue. The redistricting will make each ward virtually the same in terms of population. Under the new plan, Ward One will have 1,009 residents, Ward Two, 987; Ward Three, 998; and Ward Four, 998. To make the numbers equal, planners had to add residents to Wards One and Three and take away from Ward Four. The redistricting was necessary after the city annexed the Shoreline Park area in 2006. Prior to the 2006 election, the city received an emergency redistrict plan to place all of the annexed area in Ward Four until the complete plan could be drafted. With city elections looming this November, the city must complete its new plan by June, when the qualification period begins. The new plan splits the annexed area into Wards One and Four. The new redistricting plan will be adopted for this year’s election, but it may change again in the near future. After the 2010 census, the numbers will be reevaluated and the issue may be revisited, Longo said last month. The Board of Supervisors learned this week that the U.S. Corps of Engineers has issued a permit for the county’s new jail site on Highway 90 near Springwood Park. The Corps permit constitutes the final hurdle supervisors needed to cross before purchasing the property and moving forward with the project, Board President Rocky Pullman said Friday. In December, the board gained environmental clearance from the Department of Housing and Urban Development, after the county published a finding of no significant impact in September. The Corps permit was necessary because the county wants to fill about 12 acres of previously undisturbed wetlands. The new jail is expected to be built on 53 acres of land adjacent to the NASA buffer zone on the north side of Hwy. 90. The budget for the jail project is $37.5 million. It comes from the $200 million Ground Zero Action Plan through HUD. Supers plan to construct a new jail, sheriff’s office, and justice court at the site. Once the property is purchased, the county can take bids for the project, Artigues said. Pullman said he expects the county to purchase the property within a month and then move forward with taking bids for the jail. Perez Architects–a New Orleans-based engineering and architecture group–has been working with the sheriff and judges on the plans for the facility. Camp, Dresser, and McKee (CDM) is the engineering firm for the project and Whites Construction will be the construction manager. Final plans should include a 312-bed jail and a justice court with a capacity of 300 people, Pullman said. The sheriff’s department’s administrative offices will also be included in the 50-acre facility. Currently, the sheriff’s department and justice court are located in Kiln and the temporary jail is on Longfellow Drive in Bay St. Louis. The new jail will include seven blocks, a booking center, medical facility, recreation yard, kitchen, laundry, and administrative offices. Each one of the blocks will contain a series of cells which will be capable of holding different number of inmates. For instance, in the low security block, the cell will be capable of holding six to eight inmates, whereas in the maximum security area, each cell will only hold one to two inmates, officials said. The facility is expected to be about 100,000 total square-feet. Sheriff’s Administrator Ronnie Cuevas said last year, that to comply with current state and federal jail standards, he estimates that the jail will need 48 officers–12 per shift–to man the facility. Currently, there are only eight full-time correctional officers and three part-time officers employed at the jail. Prior to Katrina, the jail on Court Street held a maximum of 132 prisoners and had 20 full-time officers with four part-timers. To offset some of the operation and maintenance costs, the county plans to detain up to 80 state trusty inmates or even federal immigration prisoners, Pullman said. A body found on the side of a road in Harrison County Tuesday evening was identified by Harrison Coroner Gary Hargrove as that of Wanda Lafern Holling, age 70, of Kiln, who was reported missing on Jan. 5. Hargrove as yet had not released a cause of death, but Garber said the case is being handled as a homicide. He said it had not yet been decided whether Harrison or Hancock county authorities will be in charge of the case, but investigators from both counties are working very closely together on it. Hancock County’s lead investigator is John Luther. For days following the missing persons report, Hancock County Sheriff Department’s Special Operations Unit – under the direction of Major Matt Karl and made up of deputies, firefighters and trained civilian volunteers, along with, Gulf Coast Search & Rescue Unit – searched the rugged woods near the Holling’s home. During the search, people on foot, four-wheelers and horseback combed the area. Mrs. Holling resided on Highway 603 near County Road 312. Sheriff’s Investigator John Bunce and Investigator Brandon Normand conducted a sonar search of a burrow pit and a creek near the residence of Mrs Holling’s and found nothing of interest. After Mrs. Holling was missing, Garber said his department received a number of tips which turned out to be less than helpful. On Jan. 5, Hancock Deputy Ricky Trudell recieved a report from a family member that Mrs. Holling was missing from her residence and had last been seen on the Jan. 3 by Timothy Evans. Witnesses had indicated that Mrs,. Holling may have left the state with an unnamed couple, Garber said at the time. According to Timothy Evans, a male boarder, Holling reportedly had departed from her residence that Sunday morning with close friends, bound for a vacation in Florida. Normand said yesterday that the investigation is continuing. Opponents of the plan to create a 200-slip marina and waterfront improvement project in Bay St. Louis say the plans look impressive, but fear they may be too far-reaching and – ultimately – too expensive for the city to maintain. A small but determined choir of voices is beginning to be raised against the proposed Bay St. Louis marina and waterfront improvements project, which has widely been characterized as a development that would catapult Old Town into overdue economic prosperity. During a recent public hearing held over the proposal for the multi-million dollar project, a long line of speakers praised the marina idea. At that meeting, questioning the plan seemed considered akin to cheering for swine flu. Although a few critics did appear, speaker after speaker at the lengthy, crowded hearing on Jan. 21 talked about the city’s need for economic recovery, and held up a marina and waterfront improvements on Beach Boulevard as a panacea. But not everyone agrees, or even believes a marina would be successful in the proposed location. Some believe a project located off Washington Street, in the bay’s outer reaches and away from bridges, would have a better chance for success. Some are questioning the project’s costs, logic, economic chances, and a feasibility study that was performed on the project. There are other questions about a city-appointed Harbor Committee that has been steering the project without informing the public when it meets. As proposed, the marina, a new pier and parking area would be built on the beach front between DeMontluzin and Court Streets at a projected cost of more than $22.5 million. The lion’s share of the money comes from federal grants. But as doubters see it, a city-owned marina with more than 200 boat slips could easily turn into a boondoggle. They fear the project would call for monumental maintenance, extravagant insurance costs and other liabilities, and would fail to lure the large numbers of luxury boats predicted by supporters. Plans are for the city to own the operation, but have it run by a management firm. However, even with professional management, skeptics say, a marina would run substantial risk of going belly-up and leaving the city holding the bag. “What’s our guarantee in four years, when this thing flops?” said Ernest Beckemeyer, a beach property owner whose popular bar, The Good Life, disappeared in Hurricane Katrina. Beckemeyer is currently waging two lawsuits filed in connection with eminent domain proceedings on portions of his beach-front property near the marina site. He points out that with a marina built behind their land, property owners would lose their beach-front access and essentially be hemmed in. Before Hurricane Katrina, The Good Life faced the open beach and bay from the rear. “Beach-front property owners will not be beach-front property owners any more,” he said. The project is also being questioned by Old Town resident Carroll Gordon, a retired businessman who has written the City Council and Mayor Les Fillingame about his concerns. Gordon said he supports waterfront improvements that would bring economic growth to the city, but believes the project as planned presents excessive risk. He said the feasibility study lacks substance and documentation. When the study was approved by the City Council in 2008, former Mayor Eddie Favre said its cost would be capped at $120,000. Payment was to be made through grants, and the feasibility study eventually involved an engineering firm and three consulting groups. Among his other observations, Gordon said the study lacks adequate supporting sources for revenue projections and does not discuss capital costs for a marina, including insurance, maintenance, environmental control, waste processing, and other items. Scarce attention is paid in the report to problems boaters would encounter with the CSX Railroad bridge, and dredging costs “will be high and frequent,” Gordon said. The marina’s position places it between the CSX railroad bridge and the highway bridge along U.S. 90, creating potential approach problems for larger boats. That was in reference to a five-member Harbor Commission, which was appointed by Favre before he left office. The commission has been meeting at City Hall with project engineers, regulatory officials and city administration official Buzz Olsen, but its meetings have never been publicly advertised or announced. Harbor Committee member Chet LeBlanc denied that the public has been intentionally left out of the process. Beckemeyer also said property owners who operated businesses along the beach front before Katrina have never been consulted on the marina, or invited to participate in the process. “My business was there for 20 years, yet my help or advice was never sought, though it was offered,” he wrote to the City Council. Critics also express concern that since millions of federal grant dollars are funding the project, the costs don’t appear to have real meaning to local officials and marina proponents who are planning how to spend the money. “If you look at this as a business plan, you have to come down to a realistic view of the costs,” Gordon said. Diamondhead residents protesting the incorporation of their area into a city will hold an informational and fund-raising session Sunday afternoon. The meeting of Concerned Citizens of Diamondhead will be held at 3 p.m. Sunday at 898 Hapuna Place. Members of the group recently filed an appeal to the Mississippi Supreme Court to fight a lower court ruling that Diamondhead become incorporated. The group said many citizens who signed a petition favoring incorporation believed a city government would replace the Property Owners Association in Diamondhead. “That was absolutely false,” and residents will still pay property association dues in addition to city taxes after incorporation, the group said in a notice of its Sunday meeting. More information on the meeting is available by calling 255-8491. FEMA disaster recovery trailers stand lined up in this file photo. “Just go ahead and sign their death certificate,” said Paul Nelson of Coden, Ala., who contends his mother died because of formaldehyde fumes in a FEMA trailer. 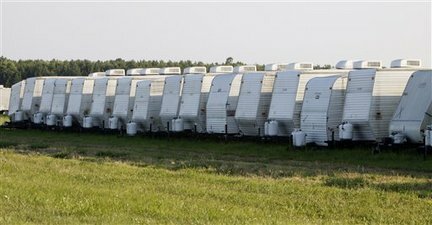 The 100,000 trailers became a symbol of the Federal Emergency Management Agency’s bungled response to Katrina. The government had bought the trailers to house victims of the 2005 storm, but after people began falling ill, high levels of formaldehyde, a chemical that is used in building materials and can cause breathing problems and perhaps cancer, were found inside. Many of the trailers have sat idle for years, and many are damaged. The U.S. Agency for International Development, which is coordinating American assistance in Haiti, has expressed no interest in sending the trailers to the earthquake-stricken country. FEMA spokesman Clark Stevens declined to comment. “While I continue to believe that these units should not be used for human habitation, I do believe that they could be of some benefit on a short-term, limited basis if the appropriate safeguards are provided,” he wrote. “This isn’t really the best time for the RV industry to have very low-priced trailers put out onto the market,” said the group’s spokesman, Kevin Broom. How much formaldehyde the trailers contain — or if they still have any at all — isn’t known. The auction site warns that the trailers may not have been tested for the chemical, and FEMA said buyers must sign an agreement not to use the auctioned trailers for housing. Broom contends the majority are “perfectly safe,” and “the handful of trailers that might have a problem” can be removed. Though the formaldehyde fumes in the trailers may have lessened with time, Haiti’s hot, humid weather would boost the amount released, said Becky Gillette, the formaldehyde campaign director for the Sierra Club. Lindsay Huckabee, who blames a rash of illnesses on the two years she lived with her husband and five children in FEMA trailers in Kiln, Miss., said that while “some shelter is better than no shelter,” sending FEMA trailers is a bad idea without tight controls and warnings. “I think it’s very self-serving to hand off a product that’s not good enough for Americans and say, ‘Hey, we’re doing a good thing here,'” she said. 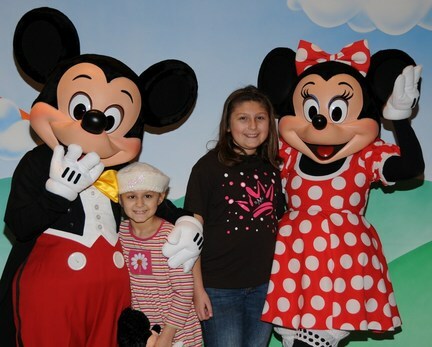 7-year-old Sophia Mohler, left, and her sister Katelyn, 11, pose with Mickey and Minnie Mouse during Sophia’s Make-A-Wish trip to Disney World in mid-January. While in Houston last October, Theresa Mohler of Ocean Springs had a troubling thought: that her family might never again be able to visit Disney World, one of their favorite destinations. At the time, Mohler’s 7-year-old daughter Sophia was at the city’s M.D. Anderson Cancer Center receiving treatment for an inoperable brain tumor, and the thought of a road trip to central Florida didn’t seem plausible. Thanks to the Make-A-Wish Foundation, Sophia, her 11-year-old sister Katelyn, and their parents left Jan. 14 for a week in Orlando. at the Give Kids the World Village resort, visiting Disney World, Sea World and other amusement parks during the trip. “They wanted us to be able to take a vacation and not have to worry about anything,” Theresa Mohler said. When Sophia’s doctors became concerned that her blood counts were too low and decided she needed lab work done, Make-A-Wish even facilitated that while they were at Give Kids the World, Mohler said. Sophia learned of the trip in her second-grade classroom at St. Alphonsus in Ocean Springs on Jan. 13, the same day her distant cousin, Mayor Connie Moran, brought her a proclamation saying that day was Sophia Mohler Day. Some of Sophia’s Disney-related wishes were to have a private audience with Tinker Bell, who she missed during a previous trip, and to attend the Wonderland Tea Party where Alice and friends sing songs and bake, big surprise, cupcakes. “She said that was her favorite thing of the whole trip,” Mohler said, adding that Katelyn helped dress Sophia up as Alice — makeup and nails included — for the “kids-only” tea party. “It was very special for all of us, that we were able to do something normal,” Mohler said of the trip. It’s been an encouraging month for Sophia and her family. In addition to all that’s happened, her mom reports that her blood counts are back up and her doctors are “very pleased” with her last MRI and the effectiveness of her treatment. “They felt the tumor was still responding to the radiation and chemotherapy she’s on right now,” she said. So now the Mohlers are back home, where the community and its “angels on Earth” keep a firm embrace around them and their brave second-grader. The parents have reopened the Tato-Nut doughnut shop they own in downtown Ocean Springs, and though it seems to be business as usual, Theresa is still thinking about the support they have received during such a tumultuous time in their lives and the vacation they were able to enjoy, after all. Merchants in downtown Long Beach are all smiles. That’s because Jeff Davis Avenue re-opened late Friday morning following many months of construction. The road was scheduled to officially re-open to traffic on Monday. But downtown retailers certainly aren’t complaining about the early removal of the barricades, they’re celebrating. They’ve been anxiously awaiting the street re-opening for many months. The owner of Bankhouse Coffee was almost giddy with excitement; like someone slipped an extra shot of espresso in his morning cup. “We’ve put up with a lot,” Shawn Montella said. The coffee shop owner said re-opening the street means so much to downtown retailers. “Business. Business. Traffic. Peace of mind. Relaxation. Clean floors. You name it, I can’t even tell you what it means. It’s incredible,” he said, almost at a loss for words. Plenty of orange and white barrels remain and the downtown is still a construction zone, since workers must still finish the sidewalks, curbs, gutters and other finishing touches on the $6 million project. But the return of traffic on Jeff Davis is plenty of reason to celebrate. Bobby Magee works at the Sonic Drive In downtown. “We’ve been waiting on this. Work some extra hours and make some more money,” he said, smiling. Every business on Jeff Davis has sacrificed with far fewer customers over the past several months. They welcome the return of business lost to the pains of progress. Not only is the street re-opening welcome news for existing merchants downtown, the finished project is expected to help boost future business development in the downtown area. Gary Ponthieux is the Ward 1 alderman in Long Beach. “We’re open for business. Developers, businesses, everybody along the gulf coast, we welcome them. We hope they come over here soon to check us out, and see all the activity going on in our great city,” he said. Merchants are anxious to show off the new streetscape. “It’s absolutely incredible. Incredible. There’s nothing else I can say,” said Montella. The entire $6 million project on Jeff Davis Avenue should be finished by late spring. Construction also continues on the new Long Beach city hall downtown. That facility should be done by early this summer. A Hancock County musician has co-written a New Orleans Saints tribute song that is getting lots of air time on radio stations in Louisiana and Mississippi. The song is called “The Who-Dat Roll ” and it was recorded in Nashville by the Williams Riley Band. There were three huge Saints fans behind the lyrics of the “Who Dat Roll,” Gary Thibodaux from Louisiana, his son Travis and Hancock County’s Shea Michaels. “I kind of gave a little contribution which I’m excited to have done to be a part of it,” Shea Michaels said. Thibodaux started writing the song in his living-room while watching a Saints game but never completed it. That is until his son Travis pushed the issue. “We needed a few lyrics to finish the tune and we were starting to get desperate to really get it out because they were doing so good,” Thibodaux said. Travis and Michaels had worked on previous projects together and collaborated on this one. Their hard work began to pay off after a nationally known group, Williams Riley Band, agreed to record the song. The song writers say so far they haven’t heard from any of the Saints players concerning the song, but say some feedback would be a dream come true. The song is available for download on iTunes, or just listen to it online at www.williamsriley.com. South Mississippi businesses now are weighing in on the who owns ‘Who Dat’ controversy. The owners of Triple ‘G’ Tees run a stand in Poplarville to sell New Orleans Saints merchandize. Some t-shirt businesses have received letters from the National Football League demanding they stop selling shirts with ‘Who Dat?,’ the long time cheer of Saints fans. Larry Gonzalez owns Triple ‘G’ Tees. He said has not received a letter; however, he says if the NFL didn’t have a problem when fans wore paper bags over their heads, the league shouldn’t have a problem with it now that the team is in Super Bowl. He said it has been the fans and the small business owners who have kept the phrase going all these years. On Saturday, Louisiana Governor Bobby Jindal asked the state attorney general to look into a possible lawsuit over the ownership rights to the popular New Orleans Saints phrase. You are currently browsing the Waveland Watchers blog archives for January, 2010.